Is it possible to be active without exercising? MD Thordis Berger has 5 tips of things you can do. Being Active: Doctors recommend that we should get at least 150 minutes of ‘moderate intensity physical activity’ every week to reduce the risk of heart disease, cancer and obesity. But in today's world, the majority of people don't have time to go to the gym every day. But is there a way to stay active: simply by doing the chores we have to do anyway and burn calories at the same time! If you're looking for ways to stay active at work here is our executive workout to keep your routine in top shape. 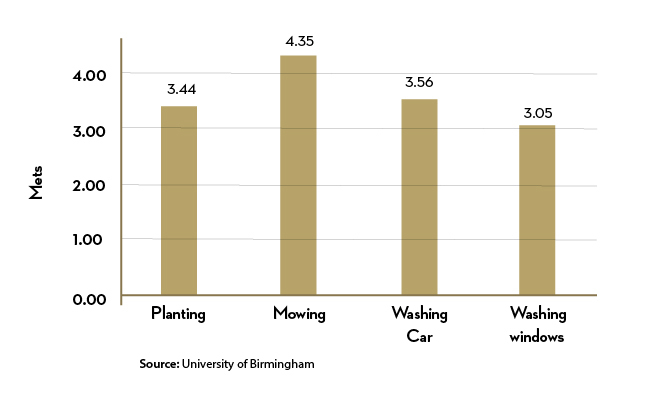 The University of Birmingham monitored how much physical work allows us to work out. On average, all except two of the everyday tasks that were studied, counted as moderate intensity exercise! 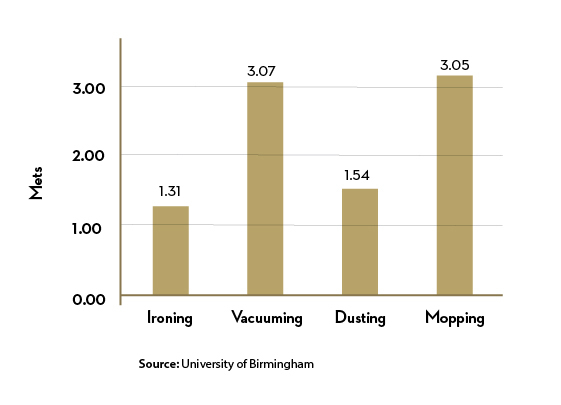 The graphs below show the results from the indoor, and outdoor activities. Ironing and dusting both scored below 3 METs but all of the others had a score higher than 3 and so count as moderate intensity exercise. Exercise at work. Do you have a 30-minute meeting at work? Have a walking meeting instead. Steve Jobs was known for doing this. Walking is an easy way to stay in shape and it requires only a pair of supportive and comfortable shoes. Besides it is an activity that you can do pretty anywhere. Even a 15-minute brisk walk is enough time to get close to 1,5 km walked. A similar suggesting is to take a walking tour of your city. This is a fun way to spice up your routine and you can learn something new and the same time being active. You can also try Geocaching. Geocaching means working out, socialisation and being on a treasure hunt, all at the same time. We all know being active is fundamental but how much exercise is enough? Posted in Fitness, Medical and tagged Active Lifestyle, Exercise, Medical, Metabolism.